When we look at buying a new machine for a factory, or creating a new budget for a sales promotion, we create a return-on-investment analysis to make sure the money we are spending will create value back to us in some way. What if I told you the money you were about to spend would add days to someone’s life expectancy? Would you determine this was a good way to invest your money? More than 400 people had that news delivered to them this past weekend in Arizona at the Seena Magowitz Golf and Spa Weekend to support the TGen Foundation in its quest to find a cure for pancreatic cancer. Dr. Daniel Von Hoff and his very talented team of scientists were able to conduct a trial using a new drug combination funded by money the mattress industry donated. That trial proved the drug combination actually did extend the life of the people taking it. In one example, my friend Howard Young used this new medicine in his recent relapse with pancreatic cancer and is back to being cancer-free and ready to walk his oldest daughter down the aisle for her wedding. 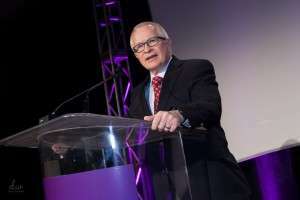 What if we continue to support the Seena Magowitz event in a significant way, and what if because of that event we actually cure this disease and make the kind of impact on pancreatic cancer that the Susan G. Komen foundation is doing for breast cancer? It is going to happen. There is no doubt in my mind. Will you be one of the people who help? 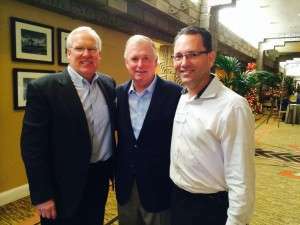 I serve as a marketing advisor to Roger Magowitz and the national committee for TGen, and we met during the golf and spa outing to discuss our plans for 2014. Former Vice President Dan Quayle was there as a new board member for the TGen Foundation and is very excited to work with us to educate people about the incredible work TGen is doing in the personalized medicine space. He has a big heart for this group and is already hard at work helping them advance the ball. For the first time, we are going to fund an aggressive marketing campaign that tells the TGen story and raises money so they have the funds that are truly needed. The next big step on the pancreatic cancer front is to create a “mammogram” test to be able to discover pancreatic cancer in the very early stages. If we keep finding this disease in the late stages, the survival rate will continue to be among the worst for all cancers. This next step has to happen, and with the support of our industry, it will. 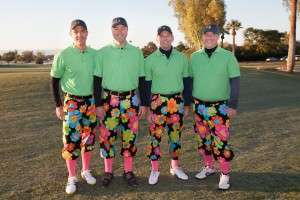 The crew from Sleep Train won the Ugly Golf Pants contest again this year. To everyone that attended the event, thank you for being there. For those of you that have in the past but didn’t make it this year – come back. And for those of you that have never been, I am asking you to please work it into your 2014 budget. If you are a retailer, put some pressure on your bedding brands and other retailers. If you are a bedding brand, put some pressure on your suppliers. If you have been to Magowitz before, get on the phone and tell your circle of friends that we need them to come and you can promise them it will be the best event they attend all year. And bring your wife; it is the perfect getaway for you both to enjoy what matters most in this business – our relationships with others that share a passion for the furniture industry. Which brings me to my final challenge: I would really like to see our brothers and sisters on the furniture side join us in this effort! Thank you, Dr. Von Hoff and your team, Michael Bassoff, Erin Massey, and everyone else at TGen that works so hard to find a cure. A special thanks to Roger Magowitz and Liz McBeth, who are the heart and soul of the Seena Magowitz Foundation. Thanks to my friend Steve Stagner and the rest of the Mattress Firm organization for their hard work and $100,000 donation this year! I would also like to thank Karl Glassman, President and COO of Leggett & Platt, for his willingness to serve as the honorary chairman for the past two years. I am proud to work for a company that supports this cause so strongly, and am grateful to be a small part of what is going on. Finally, thank you to my friend Ira Dean and all the musicians and celebrities like Jim McMahon (formerly with the Chicago Bears) who shared their time and talent at a fun evening concert that capped off the event in a big way. I hope you join us next year, and experience this amazing weekend firsthand! You’ll be glad you did. Until then, click the image below to see more photos. Click this image to see the full photo album.